Sample shown in an Ivory napkin with a Pink Matte imprint, EESB typestyle and Horizontal Centered placement. 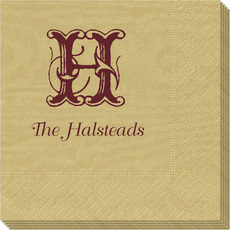 Sample shown in a Gold napkin with a Burgundy Matte imprint, ELED typestyle and Bottom Right placement. Sample shown in a Blue napkin with a Silver Satin Foil imprint, EIRS typestyle and Horizontal Centered placement. Sample shown in a Charcoal napkin with a Lavender Metallic Foil imprint, EEDN typestyle and Horizontal Centered placement. $30.07 $42.95 As Low As $0.25 ea. Set of quality moire napkins with a rich moire finish. 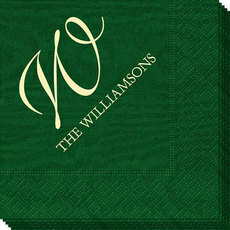 These monogrammed napkins feature a larger single letter monogram positioned over your personalization. 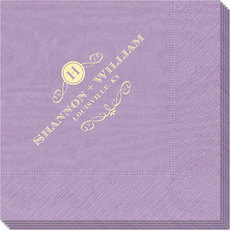 Select your napkin color, imprint color, typestyle, and positioning of personalization. Napkins are shrink wrapped in sets of 50.